Happy Wednesday! Here are some of the books that we’ve been perusing through the past 2 weeks. We were on vacation last week, so the majority of our reading came through audio books while driving. I love that my boys are audio book fans. I’m sure yours can be too! 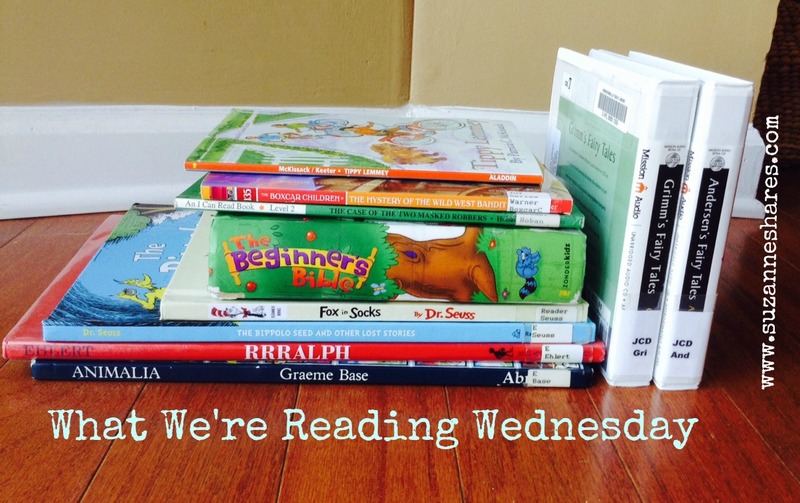 To read previous “What We’re Reading Wednesday posts,” click here. Hunches in Bunches and Oh, the Thinks You Can Think! (by Dr. Seuss)-If you didn’t notice between “What We’re Reading Wednesday” Installment #4 and today’s installment, we are currently on a Dr. Seuss kick with my youngest son! He can’t get enough of Dr. Seuss, so we’re emptying the library’s shelves of any and all of his books. We enjoyed both books, but I was especially encouraged by the story of Oh, The Thinks You Can Think! The encouragement of children to imagine and dream was the core theme. I feel like children these days are losing their imaginations, so read this and inspire your kiddos! AND…after you read it, let them have some paper, tape and crayons and create and imagine something new today! The Core: Teaching Your Child the Foundations of Classical Education (by Leigh Bortins)-We just finished our second year of Classical Conversations, and we could not have found a better fit for our family! I write about Classical Conversations on this blog a lot. If you are curious about what Classical Conversations is or how you can classically educate your child at home, this is a “must read.” I’m embarrassed that it’s taken me 2 years to read The Core. I think it would have helped me tremendously to have read it our first year. However, I was also a Classical Conversations tutor our first year, which had a huge learning curve. I didn’t do much reading last year. ha! I love the explanation of the 3 stages of the Classical Model: Grammar, Dialectic, and Rhetoric and how this book “freed” me up as I continue to learn day by day how to classically educate my sons at home. This book is geared towards understanding the Grammar stage and explains how to approach subjects like Math, History, Geography, Reading during the Grammar stage. If you are new to Classical Conversations or thinking about classical education for your kiddos, I highly commend The Core to you. I am also reading and enjoying Echo in Celebration by Leigh Bortins. It is a FREE .pdf download, so I couldn’t include it in the above picture. 🙂 It includes more information on the classical model of education and implementing it at home. It’s another great read for those new or involved with Classical Conversations or wanting to know more about the classical model. Mrs. Piggle-Wiggle’s Magic (by Betty Macdonald)-I loved Mrs. Piggle Wiggle as a child! One of my elementary school teachers read it aloud to us during rest time. I was excited to introduce my boys to Mrs. Piggle Wiggle, and they have loved her as much as I have! After reading the initial book in the series, Mrs. Piggle-Wiggle’s Magic , my sons have insisted that we read all of the Mrs. Piggle Wiggle books. I happily obliged! Mrs. Piggle Wiggle is a quirky old lady, who eagerly helps parents experiencing crazy behaviors from their children. Mrs. Piggle Wiggle’s cures usually comes in the form of a magic concoction to help with such behaviors as being a tattle tale, constantly interrupting, or bad table manners. Mrs. Piggle Wiggle’s magic always helps rid the child of the unsightly behavior. Our favorite cure from this book was the “Thought You Said” cure. The 3 children in this family continually fail to do what their parents instruct them because they thought they said something else. My boys laughed outloud nonstop during that entire chapter. The children’s renditions of their parents instructions was hysterical. Thankfully, Mrs. Piggle Wiggle helped the parents rescue their children using her “Thought You Said” cure. My only regret is that I can’t call Mrs. Piggle Wiggle to get this cure for my sons! ha! “Clean your room?” my boys inquire. “We thought you said, ‘swing on a broom. '” Where’s Mrs. Piggle Wiggle when you need her?!?!? Cora Frear (by Susan E. Goodman)-Cora Frear is a book in the Brave Kids series , which is a new-to-us series that we’ve been introduced to. Cora Frear was a real girl who lived on the prairie during late 19th century America. The book contains an Afterword and gives detail about the real Cora Frear; my boys loved the Afterword almost as much as the actual book! They were flabbergasted to learn that she was real! Cora’s father was a doctor, and she often accompanied him on house calls, which often involved miles and miles of travel through the prairie. The story revolves around Cora and her father making a trek across the prairie for a house call, and in the midst of their journey, they find themselves trapped in a prairie fire. I was even on pins and needles as my son read this aloud. I was the one chanting, “one more chapter, one more chapter” to him; it’s usually vice versa! If you have a child insterested in American History or if you are in Classical Conversations and looking for Cycle 3 books, Cora Frear is a gem of a book! I’ve been writing a lot recently about how much we LOVE audio books. ( If you missed the previous 3 posts that were a part of my Friday Favorites series, you can read them here, here, and here.) I’ve decided to include audio books that we’re “reading” in my What We’re Reading Wednesday posts. Since we traveled last week, I always stack up on audio books for our journey. As I mentioned, my youngest son is currently stuck on Dr. Seuss, so we enjoyed Green Eggs and Ham and Other Servings of Dr. Seuss and The Cat in the Hat and Other Dr. Seuss Favorites both collections of multiple Dr. Seuss books. We have previously started reading Little House In The Big Woods , but had not finished it. In my quick library run to stock up on audio books for the trip, I found the audio book version. It was a huge hit during our travels! 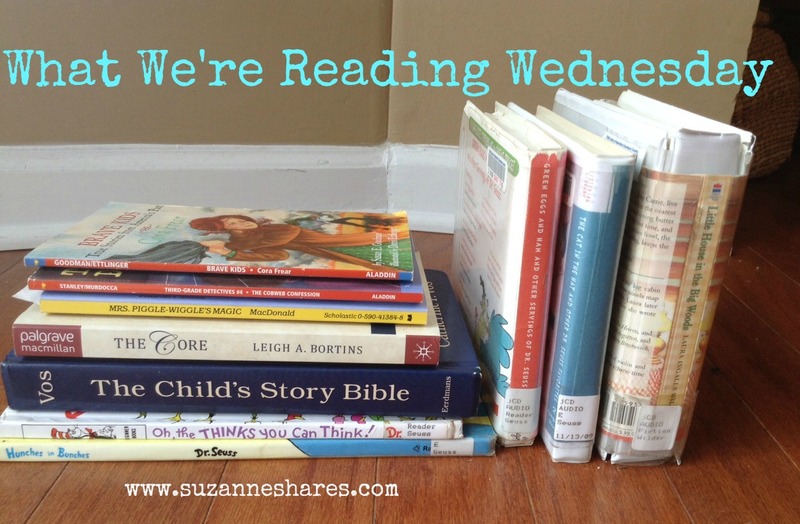 It’s Wednesday, so comment below and let Suzanne Shares readers know what you’re reading! Hip, Hip, Hooray for books and quality literature! Happy Wednesday! Animalia (by Graeme Base)–This is a fabulous alphabet book filled with alliteration! The book goes through all 26 letters, selects an animal to correspond with each letter, and describes each animal with hilarious alliterative adjectives. If you are studying the alphabet, alliteration, or animals, this is a great book to jump into! I found it thanks to Honey For A Child’s Heart. RRRalph (by Lois Ehlert)–This book was leftover from our ‘clearing the library bookshelves’ of Lois Ehlert’s books as mentioned in our last What We’re Reading Wednesday post. In classic Ehlert style, the book is filled with marvelous illustrations created and built out of the most imaginative pieces of “stuff” that you might find around your house. I read this to my 4 year old, and he asked me to read it to him three times in a row. 🙂 Clearly, HE enjoyed this book! The Bippolo Seed and Other Lost Stories and Fox in Socks (by Dr. Seuss)–A faithful reader and friend, Lorie recommended that I look at the Bippolo Seed and Other Lost Stories, so I quickly snagged it at the library. It’s a fascinating book if you’re a Dr. Seuss fan. It’s filled with seven short stories written by Dr. Seuss that were published in the 1950s but virtually “lost.” If you’ve read all of Dr. Seuss’s books, you’ll enjoy this “new” one. As we were perusing the Dr. Seuss section of the library, I came across Fox in Socks and realized that we’d never read the book. We have enjoyed the silly, spit-all-over-each-other-as-we-read tongue twisters. Much like Animalia above, it’s filled with excellent examples of alliteration. The literary device of alliteration came up in our phonics curriculum this week, so it was great fun to connect what they learned in phonics with Fox in Socks and Animalia. The Case of the Two Masked Robbers (by Lillian Hoban)-I picked this up for son #2 at the library. He’s eager to read “big” books, so I was hoping he could read this and feel confident that he had read a “big” book. He read this with me and his 2 brothers, and we all enjoyed it. The Mystery of the Wild West Bandit (by Gertrude Chandler Warner)-If you’re read any of the previous What We’re Reading Wednesday posts, you’ll notice a theme–The Boxcar Children! My boys love Boxcar Children –no secret. In this book, Henry, Benny, Violet and Jessie attend a Wild West Festival and stumble upon a mystery. Tippy Lemmey (by Patricia C. McKissack)-My oldest son is reading this book about a neighborhood dog, Tippy Lemmey, that is giving the neighborhood children fits. The story is set in the United States during the years of the Korean War. My son’s eyes lit up when he read “war in Korea” since we had just been learning about the Korean War in Classical Conversations! This book is a great read for a kiddo who loves dogs. Our current Audio Books selections have consisted of: Grimm’s Fairy Tales and Andersen’s Fairy Tales . I’ve been writing a lot recently about how much we LOVE audio books. ( If you missed the previous 3 posts that were a part of my Friday Favorites series, you can read them here, here, and here.) I’ve decided to include audio books that we’re “reading” in my What We’re Reading Wednesday posts. 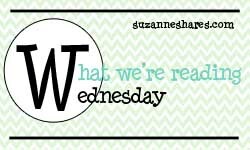 It’s Wednesday–what are YOU reading?!?! Please comment below! Can’t wait to discover great books from you, my fabulous readers! We love, love, love the Jesus Storybook Bible. Seriously, we love it!!! (Have you picked up on that yet?!?!?) Lloyd-Jones’s writing leaves me in tears almost every time I read this with my boys (or I might have even read this by myself sometimes). She beautifully weaves the story of a Rescuer coming for His people into each story that is included in the book. I love that with each reading my boys are hearing the unifying theme of Scripture–Jesus was always God’s plan (even in the Old Testament!). He was sent to rescue sinners from sin and to make them clean, right before God that He would be be known as the One, True God. The truth of God, His love for humanity saturates every page in this book. It is a treasure to our family, and as a parent, I’m thankful for this wonderful resource to have to read with our boys. Also, there’s a curriculum to go with the Jesus Storybook Bible if you’re looking for something along those lines, too! It’s less than $6! Dramatized Audio Version of New Testament–FREE! I read on a couple of my favorite blogs, Between Two Worlds and Money Saving Mom that Amazon was offering an MP3 version of the New Testament..FREE! Besides being FREE, another point of excitement for me is that it is a dramatized version of the New Testament! As I shared here a couple of weeks ago, we have several favorite Children’s Bibles that we’ve loved, loved, loved! One of them, the Word and Song Bible, has a dramatized, audio version on CD which accompanies the printed Word and Song Bible. However, it’s out of print. 😦 So, if you’ve wanted a dramatized version of the Bible for your kids to listen to, this might be just what you’re looking for! It is New Testament only, but maybe if everyone downloads it, they’ll consider going for the Old Testament, too! I listened to part of it on Amazon’s site before downloading it. It appears to be quality. It goes verse-by-verse through the New Testament whereas the others we have are summaries of each New Testament book. My boys are getting older, so I’m excited to have this “grown up” version for them. I love for my boys to have dramatized Audio books to listen to during rest time. (Yes, my 5 and 7 year olds still rest in the afternoons. No more napping for them but rather quiet, down time in their rooms.) Their little brains soak up everything they hear, so I’m excited to have this New Testament version for them! Enjoy! What’s your favorite Children’s version of the Bible that you use at home? If you’re looking for some recommendations, see my post here where I wrote a detailed explanation (including appropriate ages) of some of our favorite ones. I remember the quest to find a children’s Bible when John Martin was about 6 months old. WOW! So many choices! We stumbled upon a GREAT one, The Big Picture Story Bible, at the time, and we’ve stumbled upon 3 other great ones. I wrote all of the information for a college friend, and thought to myself, “I should post this on my blog to share with others.” Again, I remember how hard the decision was when we were searching, and we couldn’t find anyone to suggest one for us. So, if you’re like we were, I’m writing this note just for you! These 4 Bibles have TRULY impacted our family and our sons’ lives. We are GRATEFUL for that and just HAD to share!!! It gives you the “BIG PICTURE” of God’s story, His plan of redemption from the very beginning, with Christ Himself shown as God’s plan! It doesn’t have every Bible story, but it highlights those that show His BIG PICTURE plan. We are using this now with our youngest (2 1/2 years old). Our “big boys,” who are 5 and 7, still enjoy hearing it as well. They now have an accompanying CD with it. We LOVE having the Bible on CD for our boys! We let them listen to it during rest time. Suggested ages: Perfect for babies and up. After reading Noel Piper’s book, Treasuring God in Our Traditions (which is a WONDERFUL book on instilling traditions within your family that evidence to our kids that we treasure JESUS! ), she talked about how their family had “Bible time” with their daughter from an early age. When she couldn’t read, she would use the Bible with read-a-long tapes. They wanted to instill in their kids from early on the importance of daily time in God’s Word. I LOVED that idea, so, I was on a MAD SEARCH for THREE years to find a kids Bible with CD or tapes that our boys could use to “read-a-long.” A friend told us about The Word & Song Bible. This Bible has a summary and song about each book of the Bible, and the audio is on the CD so that our boys can follow along! The readings are dramatized, so it’s FUN and action-packed–not like an adult “book-on-tape.” Our boys are auditory learners, so they SOAKED this up. Our oldest, at age 3 when we first got this, would walk around quoting different “stories” from the books, impersonating the characters, and singing the songs. The BUMMER is that this is out of print. However, I’ve linked it above to some used copies on Amazon. Definitely buy the cds or tapes! Suggested ages: The Bible is probably more for school age kiddos, but the audio component can be used at any age. Two dear friends, both unsolicited, recommended this Bible to me on the same day. I thought, “Hmm, I should check it out.” I’m thankful that I did! At the time, our oldest son was almost 6, and we were looking for a Children’s Bible that included more of the Bible’s content in a storybook format. We enjoyed with him the previous Bibles mentioned, but we were ready for the “next level.” This Bible does just that. It goes into greater depth and detail with stories that are often omitted in children’s Bibles. I appreciate that about it, and it does so in a manner appropriate for children. My boys have now been introduced to the stories of Achan, Rahab, Eli’s sons, Hophni and Phineas, some of the “lesser known” Bible characters. However these stories have resonated with them and given our family wonderful fodder for conversations about God, obedience to God, the reality of sin, and our need for Christ. We enjoy reading it together at breakfast for what our boys call “Bible time.” 🙂 Suggested ages: 4 and up. I hope these are helpful resources as you seek to teach your children to know and love God! One of my favorite blogs is “I can Teach My Child.” She gives amazing, fun, creative ways to teach our own children. We’ve tried several of her ideas, and my boys have LOVED IT! Her Olympics ideas and crafts were inspiring! After reading her blog, we had the Mosley Olympics this summer in conjunction with London 2012. Our boys had a BLAST!